How can you compete with The Dorchester? 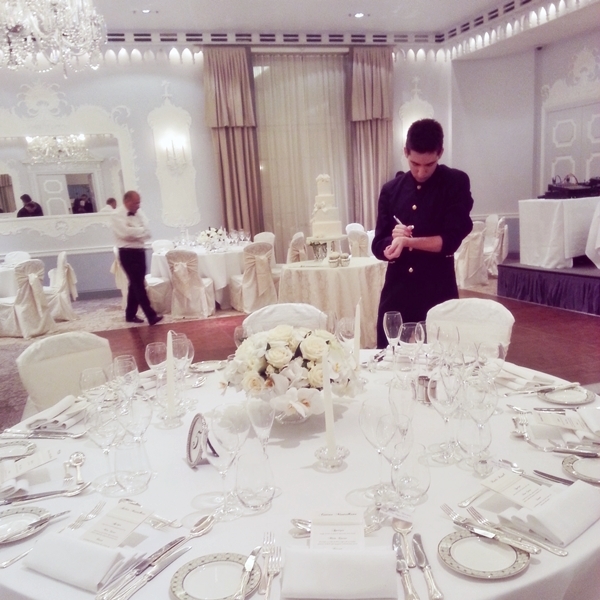 This 5-star hotel is the essence luxury and sophistication, the perfect venue for an elegant wedding. 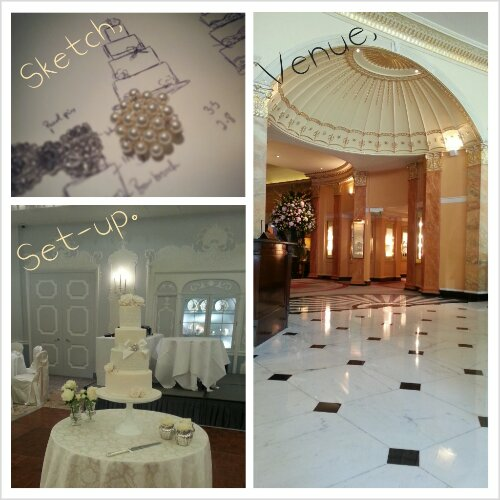 The theme and colour scheme were white, ivory and pearls. The pale blue walls of the orchid room with the white light reflecting from the chandelier made for a beautiful atmosphere. The cakes were a mix of deliciously light Vanilla Bean cake with Vanilla Italian meringue buttercream and Raspberry jam, and a rich chocolate cake with chocolate Italian meringue buttercream. They were covered in Belgium white and dark chocolate ganache, and a final layer of ivory sugarpaste. 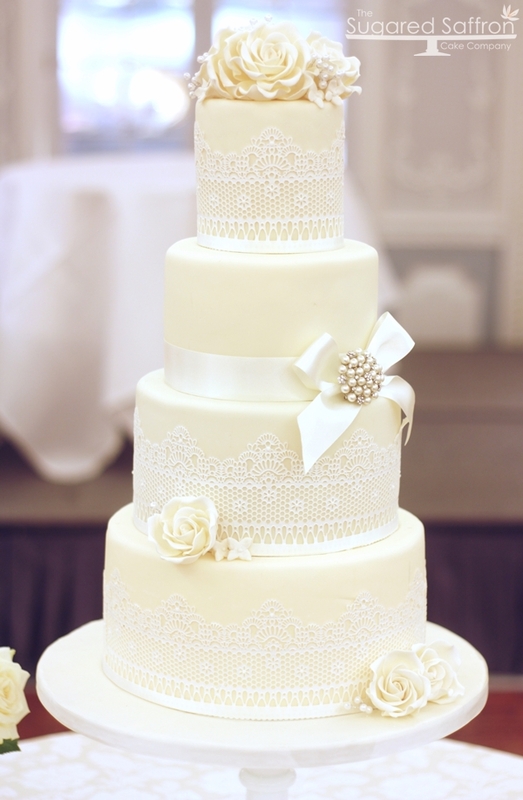 The intricate white lace design on the cake is completely edible, and the cake was topped with handmade oversized ivory sugar roses. In between the roses were pearl sprays (non-edible), to compliment the pearl brooch and ribbon. 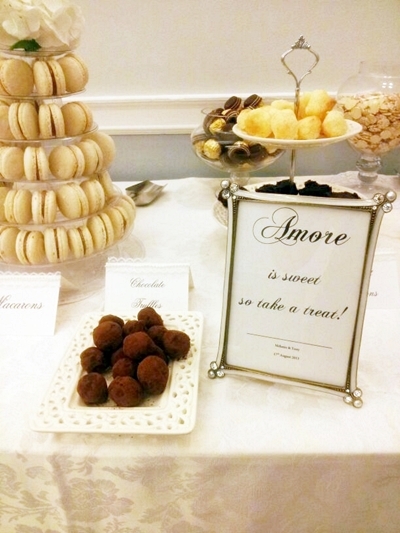 In the evening we came back to cater the vintage style dessert table which featured macarons, macaroons, chocolate truffles, choux pastry plus lots of yummy sweets. The bride and the cake were pleasure from start to finish, one of my favourites of the year! Looking delicious but more importantly beautiful! Just beautiful. Wonderful work, Asma. Beautiful cake ! Simply divine ! 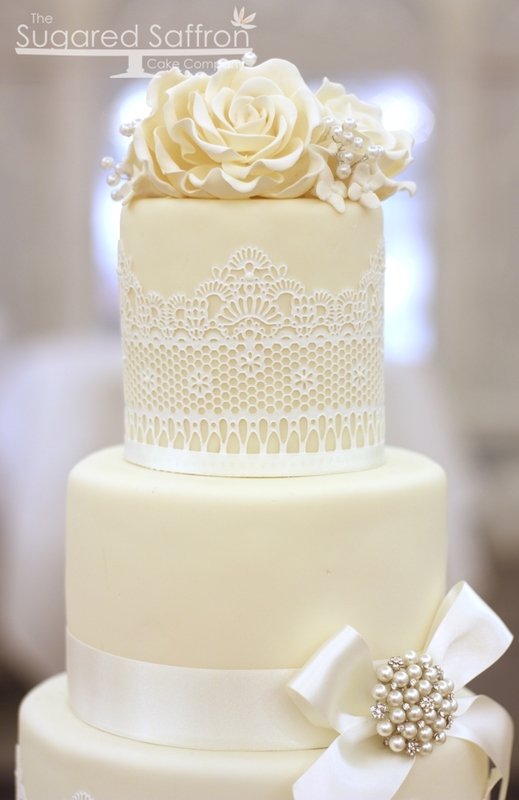 Did you use Sugarveil for the lace on the top tier ? I would love to know if that is what you used , the lace is amazing ! What a cake! So stylish and perfectly formed. I can see a lot of thought and creativity has gone into this. A benchmark for all other wedding cakes! I wish you could see my face which is actually jaw-to-the-ground-amazed at this creation! It sounds like it tasted absolutely divine too. Bravo!